Are you keen to learn new music skills, or build on what you already have? Latrobe Music organises new, different and stimulating music experiences with a range of different instruments. Workshops are conducted by highly experienced teachers. Members of the “Super Ukers” at one of their events. Latrobe Music can also organise special sessions. 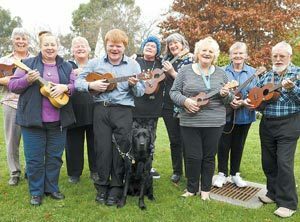 For example, we can lead ukulele workshops for complete beginners. These workshops could be run at local community centres, at schools, or private venues and could be something held in conjunction with festivals or other special events. Come and put on your dancing shoes and dance the night away or grab the mic and have a sing along with music from DJ Robby. Cost: $10 per person (plus 75c booking fee). First 50 people to book online can bring along a friend for FREE! For ticket purchase on the night, please arrive around half hour early. Introductory African drumming workshop techniques used to create the renowned rhythms from the African continent Latrobe Music is proud to host percussionist Roger Terrill for a one hour introductory African drumming workshop. Roger is a well known and respected Djembe player in Gippsland and brings with him his years of experience as a player and educator. All drums supplied or BYO Where: The VRI, 18 -20 Queens Parade Traralgon, Victoria 3844 When:	Saturday 31. August 2019 TIME:	11am-12pm or 1pm-2pm Cost $10 per person $20 for 2 sessions The workshop is limited to 30 places, so bookings are essential. RSVP By Monday 26 August 2019 How to pay: Go to https://www.trybooking.com/484588 Other payment methods are available PayPal for more information please contact Phillip Chalker on 0400603367 or Email: latrobemusic@gmail.com on the number of people who will be attending, an which sessions morning or afternoon.